It’s finally October, my favorite month! I woke up with extra pep in my step on Saturday because I finally got to put out my Fall decorations. Now there are no Griswald comparisons that can be made with my house, but I do love decorating the mantle, tables, and my front door with leaf garlands, lanterns, and pumpkins. Tons of pumpkins, both the traditional orange and the odd yet adorable white ones! There is something about the sight of a pumpkin that just makes me smile. To welcome this joyous day that I’ve been looking forward to I want to share with you my Pumpkin Bar recipe. 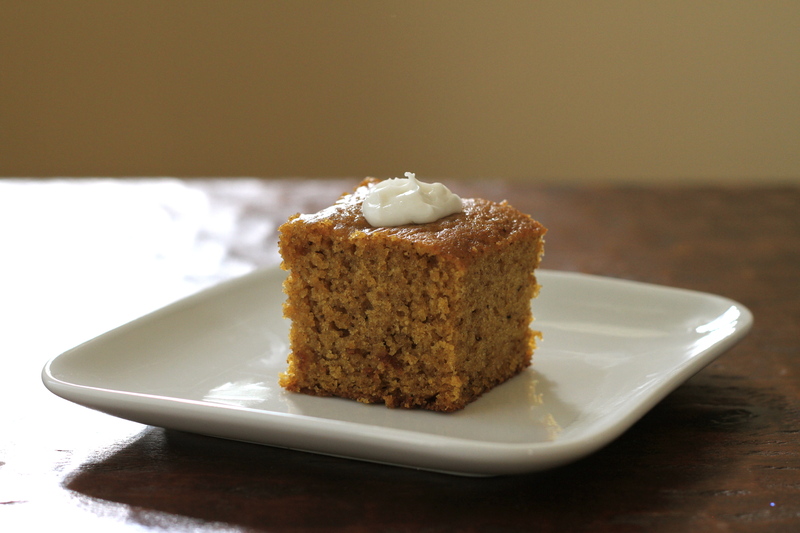 The flavors of cinnamon, clove, and nutmeg mixed with pumpkin are to die for. This cake like bar is topped with just the right amount of cream cheese frosting and is a great alternative to the traditional pumpkin pie. My family loves it so much they request this over pumpkin pie each year. Let bars cool completely before cutting and frosting. Can frost completely or with a little rosette on top.